KMW Interiors' CEO, Kita Marie Williams, lists 2018 home design and decor Trends: trends in home decor, remodeling, home staging, renovations and design KMW Interiors' CEO, Kita Marie Williams, lists 2018 trends in home staging, interior design, renovation, remodeling and design. Color is trending! Although the base colors of grey’s/silver, black, white and taupe still rule the roost, adding pops of color has become an essential element in current interior decoration. 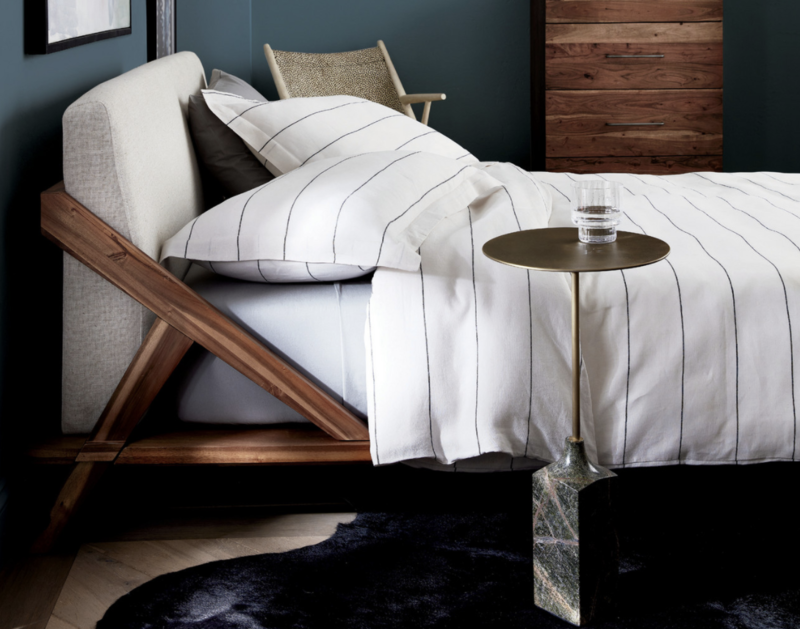 Major furniture and décor brands are adding bright pops of colors to liven up the established neutral palate. The number one color I’ve seen is 2018’s pantone color of the year, ultra-violet. Other colors I’ve seen are magenta, emerald green, indigo and shades of orange and yellow. It seems like the design community is going back to our human ancestral roots! 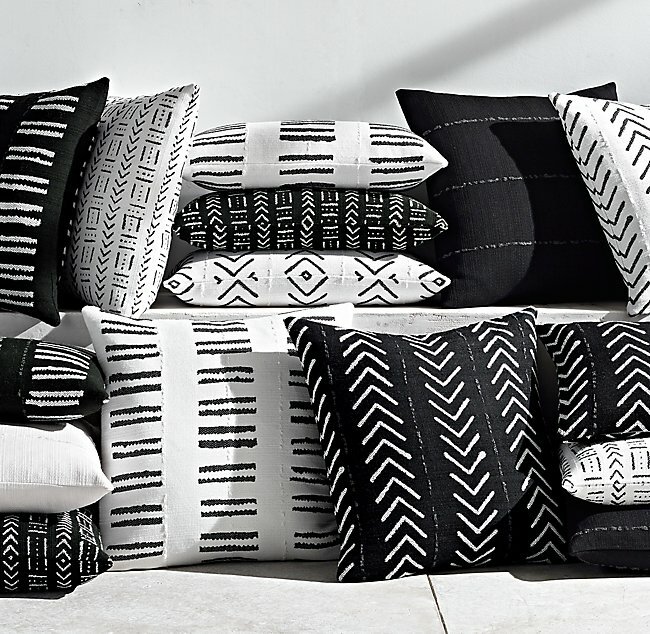 African and afro-centric design elements are showing up in countless furniture store catalogs and brand look books. The most common elements are decorative pillows, throws and area rugs. Just adding these simple elements can make your place look updated and on trend! The combo of teak elements with African mud-cloth décor really creates a current, cultural, yet casual, look. Another trend we LOVED is the continuing combination of rustic country elements with industrial details. This is really something you can see in furniture collections like those from the Scott Brothers and Magnolia Home. This trend isn’t new, however, popular furniture suppliers are providing options that make this look more accessible. So, we’ll be seeing this a lot more often in homes. 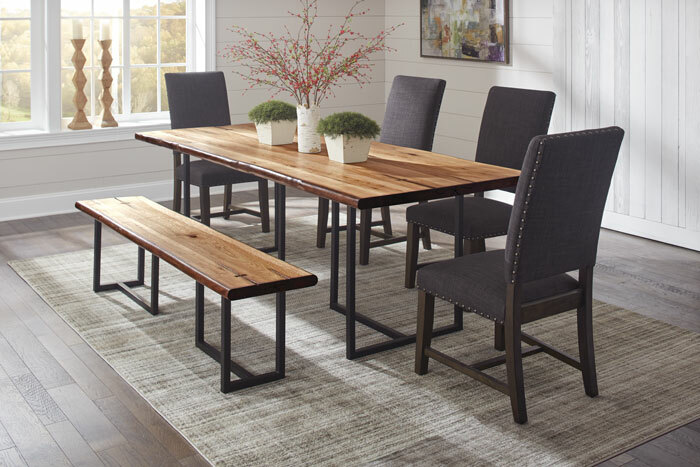 Elements of this style include: Dark iron or dark finished metal; white-washed and wire brushed wood finishes; industrial elements like casters and metal pipe accents. 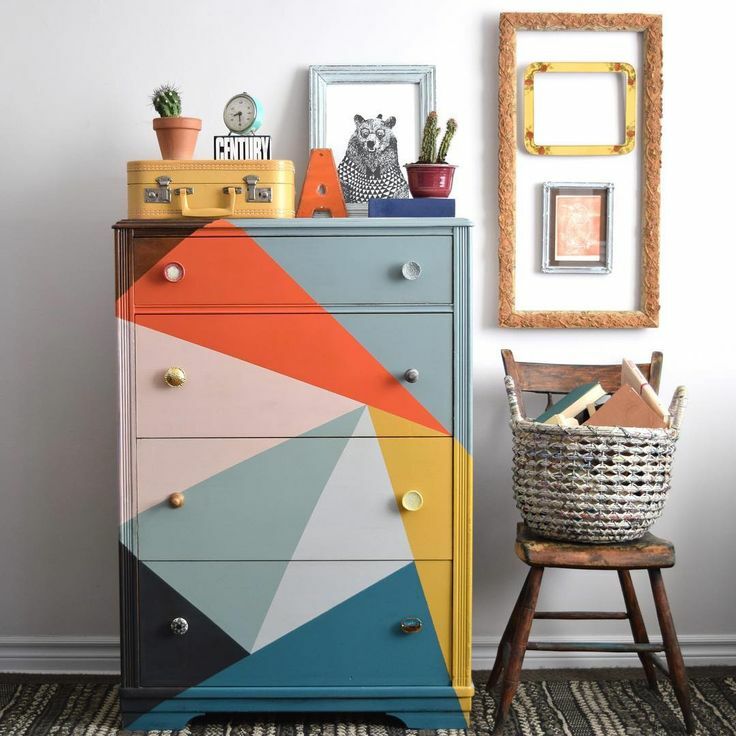 Another interesting trend that has been around for a few years, and getting increasingly popular, is geometric decor and design elements. You'll see this everywhere, from fabric prints to table bases and even kitchen accessories! This is another trend that is a reboot from the mid-century modern style that dominated the 60's. Again, the younger generations have really embraced geometric patterns and structural elements. This trend is still going strong! If you want to make something look cool and updated, forgret the bird! 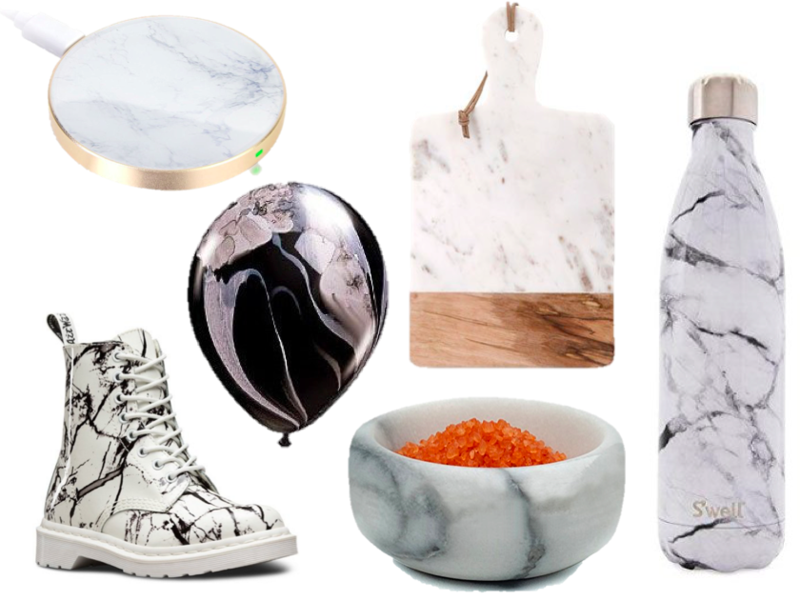 Put marble on it! This material has made it into every element you can think of for the home and beyond. Furniture, counter-tops, floors, showers, contact paper, office accessories, kitchen accessories and everthing in between! There are many alterntives to marble that look like marble without the crazy cost, like quartz and porcelain materials, so it's gotten increasingly accessible. Marble is a classy material, so I don't see this going out of style any time soon. Yup! Gold and rose gold are still in! Not only are they still in, they're showing up in more places in the home! Last year it seemed to be relegated to the accent furniture and accessory market. Now, its showing up in kitchens and bathrooms in the form of fixtures and hardware. 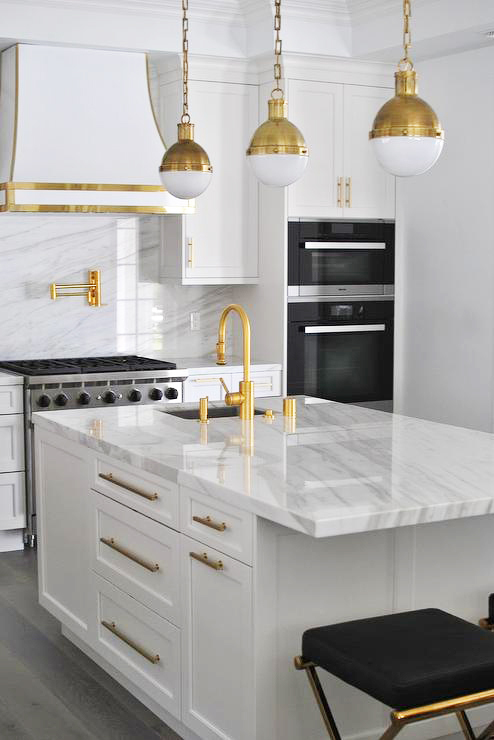 I remember the "olden" days when I was called to renovate and change out the dated 1980's gold kitchen and bath elements with stainless steel. Now, I have to put gold back in! There are a few important things to note: the fixture and hardware designs are much more streamlined and modern. Moreover, a brushed or matte finish is preferred instead of the shiny polished look of the 80's.